Noah, Sophie, and I played a quick game of Medina tonight. This was out first playing of this out of print title and we all liked it. It’s often described as a great game of “chicken” and I can see why. All players start with the same number of big chunky wooden palace pieces in orange, brown, black, and gray. 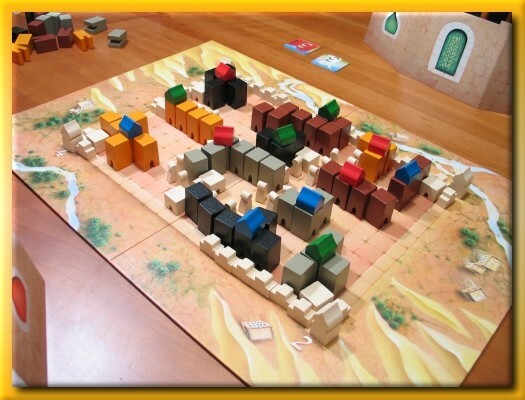 Players also have four “domes” in one color (red, blue, green, and yellow), some “meeplish” inhabitants, some stockades, and some wall pieces. Play progresses with each player playing two of their wooden pieces from behind their screen. As pieces are placed, players try to guess when it’s most advantageous to grab a growing palace for their own (by placing one of their colored domes on it) before someone else does. If you grab too quickly the palace is not worth as much. But if you wait too long, another player may grab it before you. With limited space on the board, the palaces grow with the stockades, the touching wall segments, and the roaming inhabitants increasing the value of the palace for its owner. Players also vie for point chits granted to the largest palace in each color and the last new connection made to one of the four walls that emerge from the corner towers. After all bits have been played, players tally their scores and the player with the most points wins. We initially planned only to play a few rounds to get a feel for the game but before we knew it, it was over and we all ended up just a few points apart. If you can get your hands on a copy, don’t wait and lose your chance. Jump on it. My second successful BGG trade arrived today. 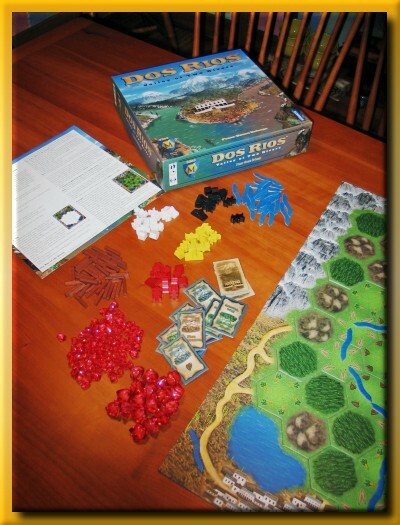 Last week Sophie mentioned that she wished we had a copy of Dos Rios so I began my quest for a copy via trade. Before my membership had expired, we’d played a borrowed copy from the CABS library and enjoyed it quite a bit. In fact, an image I took of us playing is one of my highest thumbs uploads and is the highest thumbed image for the game. My game group also played the game one year ago this month. I called it a keeper back then and I’m hoping that now that I own it, I’ll still feel the same about it. The game does have paper money which I detest. You can see in the image above, that I’m going to try using extra acrylic nuggets from my Nexus Ops “rubium” order as replacement money. The two sizes of rubium should work out pretty well as a direct replacement since Dos Rios has only two denominations of bills ($100s and $500s). My thumb count for my uploaded images to BGG reached high enough this morning for me to be awarded a Golden Image Uploader microbadge. The badge is the little golden picture frame-like thingy below the word “PATRON”. 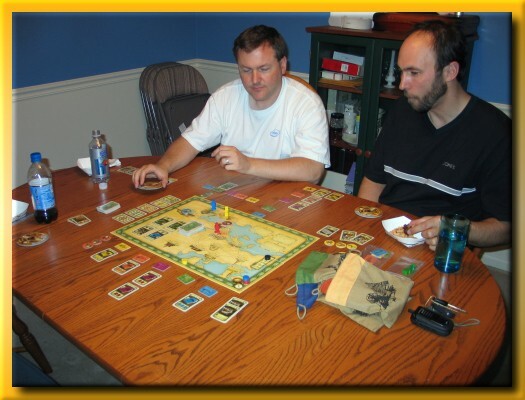 To be in the company of 36 other nerds that take artsy photographs of boardgames…it just brings a tear to the eye. Well, not specifically my eye but my wife’s eye. She’s just wondering, even more than usual, why she married me. My official BGG registration date is listed as 2002-12-26. Like most afflicted members, my single game shelf morphed into multiple game shelves on its way to a free standing wooden shelving unit. To think that my collection of 80+ games is puny compared to most reminds me just how pathological this can become. 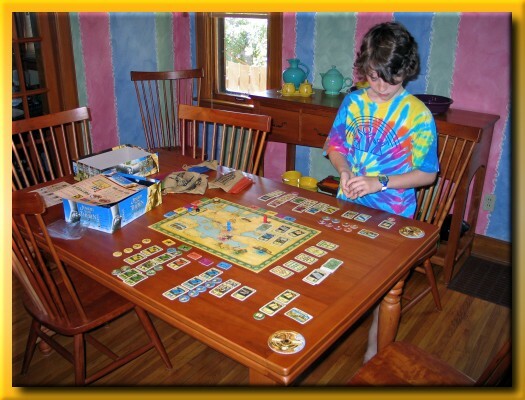 I have several games I’ve never played and in the interest of keeping my collection relevant, I’ve decided to take the plunge into the world of BGG game trading. BGG supports an active community for traders. BGG software provides the ‘matchmaking’ service allowing me to easily find members that have listed games they want in trade as they relate to games I’ve listed that I wish to trade. Once you find a mutual pair of games to trade, you can send an official trade proposal and if accepted, you each mail the games using the exchanged addresses and that’s that. Like e-Bay, members can leave trader feedback. Since I’ve not traded before and have zero feedback ratings, I thought it would be harder to find a potential trader. While excited about my first trade I am a little nervous. You see, I’m sending one of my precious games off into the void with only trust that the recipient will do the same. After two rejected proposals and one ‘no response’, I received my first acceptance. My offered title is Hammer of the Scots. At one point, I thought I’d try a block game just to see how they worked. Realistically speaking though, my two-player war gaming opportunities are highly limited and it just wasn’t going to happen. In return, I hope to be receiving a copy of Medina. This out of print title caught my eye years ago but I’ve never had the opportunity to pick up a copy. Medina is a city construction game with tons of wooden bits. By game end, you and your opponents have created a three dimensional city that looks gorgeous. I’ll be sending out my copy of Hammer of the Scots in the mail today and hope to have a successful experience. It was an extremely light night given the labor day holiday. We lost our host at the last minute but Rich stepped up to the plate and we were able to meet at his house for a couple three player games. I brought Thebes that Noah and I had played earlier in the day. I set up the board and ran through the rules and Tim, Rich, I got to digging. Overall the game is pretty light and plays really quickly. There are a surprising number of decisions to make but none seem particularly devastating if you make a poor move. Both Tim and Rich liked the game and I’m hoping to bring it back to the table for more plays very soon. 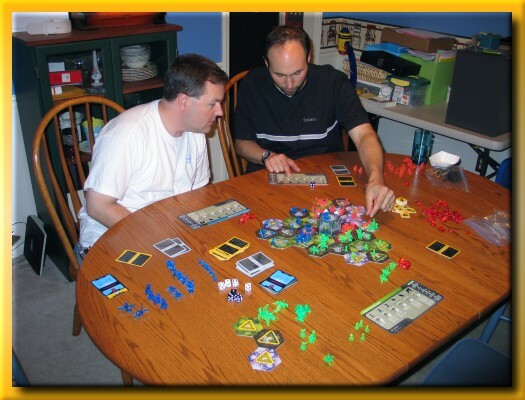 With only three of us, I thought it a good time for Rich to bring out his copy of Nexus Ops. It’s a completely different style of game than we normally play and since we usually have more than three or four, it was going to be now or never. Tim wasn’t fond of the random nature of battles preferring a more cerebral reason for losing position rather than the luck of the die. I enjoy the randomness of the battle and get a kick out of the gummi-style bits and the light play. It’s not something I’d like to play all of the time but when you’re in the mood, not much scratches the itch like Nexus Ops. Thanks Rich for hosting on quick notice. One part of the rules describe moving before you draw and another describes the movement as being taken after. Noah and I enjoyed our playing of the game, although we did play it incorrectly in a few places. He managed to totally destroy me with exhibition points and his ability to maximize the number of turns he would take in a row to catch up to my position. I felt I only had one lucky dig. Imagine my dismay being the first to dig in the ‘purple’ bag for six tokens to come up completely empty handed! We forgot to score the maximum knowledge in each color but I cannot imagine that it would have made a difference. As it was, Noah was out in front by about 20 points. Although I may sound a little harsh, I’m still looking forward my next play.